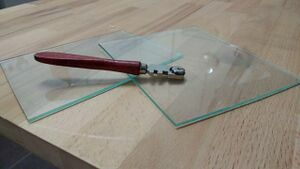 With a glass cutter, plain sheets of glass can be cut in a straight line. Experts might even be able to cut slight curves or more. Now place the cutter and cut along the straightedge (hold it tightly), slightly going towards it to avoid the cutter "walking" away from it in a curve. Do it in a smooth movement at constant medium pressure. Never cut the same line twice, so practice it on a scrap piece first. The line does not need to go deep, you will not cut the glass but instead break it at the line you defined with the cutter. Place the glass with the cut at the edge of the flat board, your cut remaining on top. Take a piece of scrap wood and put it flat on the sheet you want to keep to hold it down during breaking. An even edge should lie near to your cut to hold it down especially well in that area. Place another piece of wood with an even edge on the part you want to break away, it should have contact to your sheet on the full length of the cut. Take a light hammer while holding down your sheet and lightly hit the wood, it should distribute the impulse along your desired cut line and break away the part. It only takes a very light impulse to break it - pieces may fly everywhere so take care. A cutter typically has several carbide wheels so dull ones can be replaced quickly. Please inform a manager if you switch to a new wheel so a replacement can be ordered before all wheels are used up.